The game's first major update brings new heroes and villains to the action RPG, among other additions. Netmarble Games has released the first major content update for Marvel Future Fight. Themed around Guardians of the Galaxy, the update introduces new heroes and villains to the game, among other features. Marvel Future Fight is an action RPG which sees players exploring and clearing environments as a team of up to three heroes, which can be mixed and matched as players see fit. 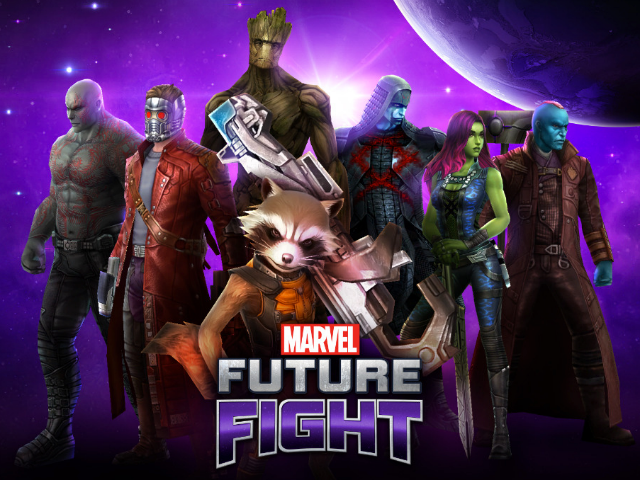 With this update, players now have access to characters like Star-Lord, Rocket Raccoon, Groot, Gamora, Drax, Yondu, Nebula and Ronan, who wear costumes inspired by the 2014 Guardians of the Galaxy film. Players can unlock these characters by collecting items in the “Special Mission” stage of the game. Elsewhere, a new Dimension Shift system has been added to the game, which triggers boss fights in the middle of standard missions. For instance, Hulkbuster or Black Cat could appear in the middle of an active battle, and players can fight these bosses to collect bonus biometrics, making the characters easier to unlock for their team. Finally, additional updates have been released in response to player feedback. These include “a more robust character customization system,” and tweaks making it easier to unlock some characters. This first update marks the first of what we hope will be a continuous stream of enhanced content and popular character additions. We look to further the popularity of Marvel Future Fight globally through regular updates set to bring players a greater gaming experience. Marvel Future Fight is available to download for free on the iTunes App Store and Google Play. The game reportedly hit 15 million downloads “barely a month” after its release in late April.